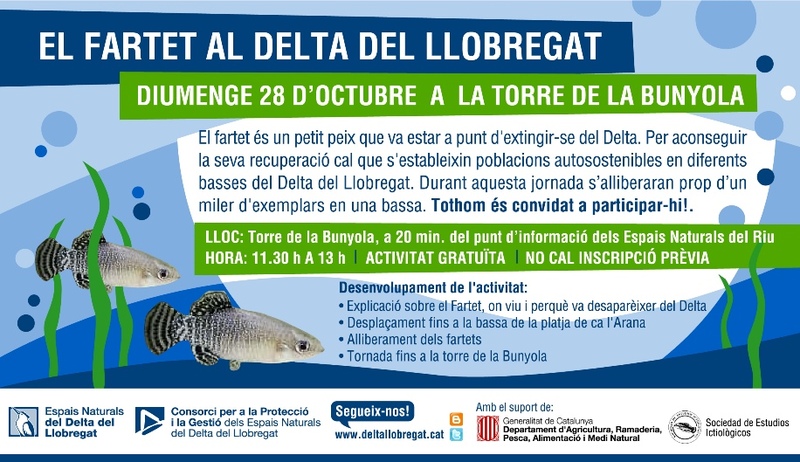 Spanish conservation group ‘Sociedad de Estudios Ictiológicos’ (SEI) will be releasing thousands of highly-endangered native killifish known locally as ‘fartet’ into a natural lagoon within the Delta del Llobregat natural park, Barcelona on Sunday 28th October, and anyone in the area that day is invited to join them, help liberate the fish, and learn a little about the challenges involved in maintaining aquatic biotopes in an urbanised environment. The day begins at 1100 am with a talk about the fish and why it’s in danger of extinction, after which the fish will be released by members of the public at the ca l’Arana beach. The beach and lagoon are normally off-limits so this represents a unique opportunity to get up close and personal with some Spanish wildlife. The fartet, Aphanius iberus (Valenciennes, 1846), disappeared from the Barcelona area for a number of years and was presumed extent, but around a decade ago a few hundred specimens were discovered in a local garden, and the SEI have been breeding it in conditions of semi-liberty within the delta park and reintroducing it at various man-made and natural localities. See the flyer above (in Catalan) and translation below or check out the SEI’s Facebook page for further information, and keep your eyes peeled here on SF for more about the great work they’re doing in Spain. We’ll hopefully bring you some pics of the release day shortly, too. This project is in association with the Generalitat de Catalunya, Department of Agriculture, Livestock,Fisheries, Food, and Environment, Ajuntamient de Viladecans, and Consorci per a la Protecció i la Gestió dels Espais Naturals dels Delta del Llobregat (Consortium for the Protection and Management of the Natural Spaces of the Llobregat Delta). The fartet is a small fish that was on the point of extinction in the delta. 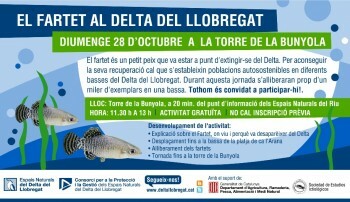 To help its recuperation we have established self-sustaining populations in different parts of the Llobregat delta. Join us to release over a thousand specimens. Everyone is welcome to participate! Place: Torre de la Bunyola, 20 minutes walking from the information centre of the Nature Park.